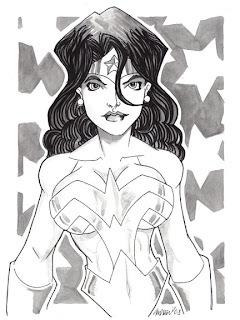 This one is my donation to the Wonder Woman Day charity auction. October 25-26 in New Jersey. "October is Domestic Violence Awareness Month. Several pop culture and comic book fans across the country have begun to celebrate Wonder Woman Day in October to raise money for local family services charities. The event has grown from one location raising $15,400 in 2006 to two locations raising around $30,000 in 2007. At Comic Fusion in Flemington, New Jersey, we are proud to have raised about $3,000 of that total for S.A.F.E. in Hunterdon, our local women’s shelter which automatically takes 25% of all cash donations to allocate to their children’s art therapy program." Comic Fusion – www.comicfusion.com (You can reach us by email at stacy@comicfusion.com and beth@comicfusion.com) The website still features all of last year’s donations. This request by one of the guys on the forum was for one of the Backyardigans. At the time I had no idea who they were. 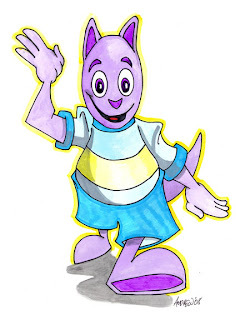 I downloaded some pic of them and picked the big Purple Kangaroo. I finished this drawing and was educated this morning by my 4 year old niece that his name is Austin. This one was a last minute request for Paul on the forum. I really like going a little crazy with the "Magic" guys. It always looks kind of cool. And this one was fun, too. 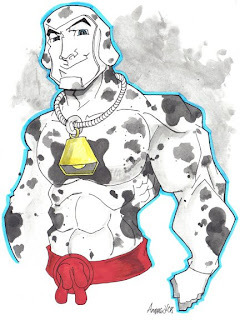 This is the third in a series of illustrations for Jim Ford and his comic strip Cow-Man. Check it out at www.com-man.com. So far, I've done Bull Chick and Strawberry Bombshell for Jim. One day I'll draw all of his characters. 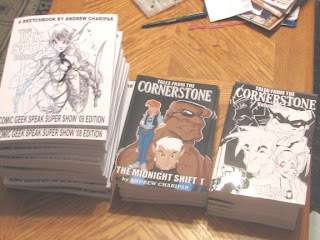 For the Comic Geek Speak Super Show '08 happening in Reading, PA on September 6the and 7th, I ordered 20 copies of my new sketchbook, The Ink Spot 2008 the CGS Super Show '08 Edition as well as copies of Tales From The Cornerstone Volumes One and Volume Two. I have very limited copies of Cornerstone (just because I could not afford to order more) but will make both, as well as the sketchbook, available on Lulu.com after the show. I did a special version of the sketchbook that will ONLY be available at the show. The first page of the sketchbook is a Signature page with the complete image from the cover of my "Fairy" and a place for my signature and a number (only 20 total). When working on the SpiderWoman sketch, I came up with idea for a new "fairy"... a spider-fairy. Came out pretty cool. I've already come up with a story line that will include my other fairy and this one in Cornerstone City. It may be the story line I do after the third Volume of Cornerstone wraps up the current story line. More soon(er later). This one is for Eliza on the Comic Geek Speak forum. She asked if any one wanted to trade her for sketches, and I offered to do a sketch for her. 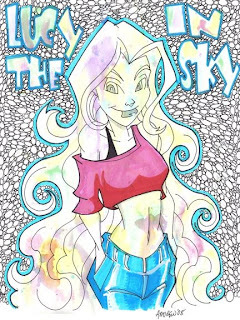 She's gonna do one of Venus from my comic Tales From The Cornerstone... looking forward to seeing. This one is for Shawn from PKDMedia. 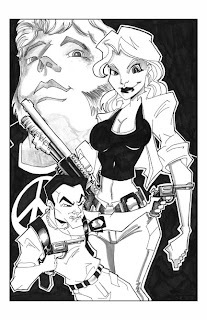 It's a pin-up for his comic series Mercury and the Murd and features Det. Beck Mercury and Lt. Lori Paint (Also Det. Adam Murdough in the background). My good friend Todd from NY has created a new website and a toy contest and is taking submissions now. Check it out at Aarting.com. It's easy, if you know how to use Photoshop or Flash or Illustrator. You down load the template, design your toy, post it on the forum and at teh end they will vote on the best and the winner gets the toys made. I've got several ideas for a line of zombies, inspired by my comic series Tales From The Cornerstone. This is the first one... ain't he cute? I still have to clean up the image (a lot before I post it). Check it out. I am a horrible friend... LISTEN TO PODCAST!! Usually, for a single character sketch, I do a thumbnail drawing, then when I like the layout, I scan the thumbnail and blow it up to the right size (usually 9/12). Then I start fleshing out the sketch and adding detail. in this case I did each character separately then added them together in Photoshop. I spent a little more time on some of the characters while some (like the Flash and Green Lantern) were just rough outlines. The next step is the outline the characters in pencil. 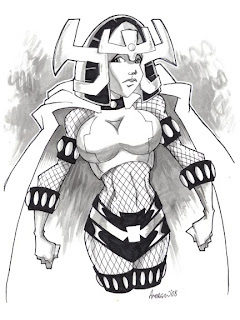 With the character I had done detail layouts for, it's simply and outline but the other were a little looser sketch. Just two different ways of penciling the page. For the next step, I add some gray tone wash effects. Adding shadows and high lights. 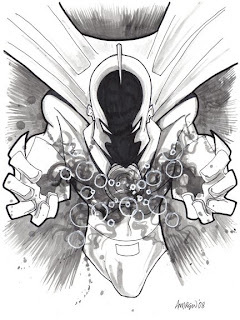 In some areas, like around Martian Manhunter's eyes or Batman's cape and cowl, I can be a little loose since I know the areas will be filled in with black. The next step is to add the blacks. I have a tendency to "out-line" all the characters to make them stand out and clean up any "mistakes" made along the way. At this stage, I pretty happy with the way this one is coming out. I wanted to "fill" the background to make the characters POP but did not want to use all black. So, I outlines the characters and then used the gray tone wash to fill most of the areas. I think it came out pretty cool and look forward to the next challenge. This one is for Bob, the Great. This one is for Gargoyle, the other half of the Waiting for the Trade podcast. Grace Choi from the Outsiders for Girl Geek of the Waiting for the Trade podcast. Check it out, it's awesome. I wasn't very happy with the way my first pass at Karolina from the Runaways came out so I re-did it. This time I used watercolors and not watercolor crayons. The original looks sooo much better than the scan.